If we talk about California electricity costs, based on the U.S. average for household electrical usage, the ordinary customer in Dixon spends about $135 per month on their electricity expenses. If you have a large household, lots of electronics or a swimming pool, your bill is probably higher. Photovoltaic power affects all of that! Looking at a yearly average, some clients are even able to lessen their total expenses to zero. That’s the monetary benefit of getting your power from the sun. Another argument for photovoltaic is that we live in one of the sunniest states in the Union. If you consider the statistics for California and Dixon, even during the winter, you can depend on a number of sunny days when your photovoltaic panels continue to operate. And that location regularity is good, not just for your wallet, but also for the planet. The less power you use from the grid, the less carbon that you are putting into the atmosphere. So photovoltaic electricity has a positive effect on the planet and it begins from the moment you turn it on. Can photovoltaic still get less expensive? With the help of a Solaron sales rep, yes it can! Both governments and municipalities offer various incentive programs to effectively lessen the cost of photovoltaic installations. 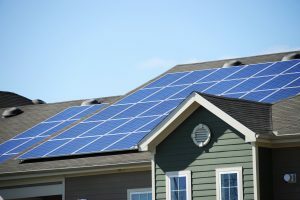 These bonuses depend on your exact location, but can substantially lessen the cost of buying your photovoltaic panels. So call Solaron today to get more information about how you can save money and the planet by means of photovoltaic power!